Lung cancer is an important public health problem. Tobacco consumption is the main risk factor and the five-year survival is only 13%, though it is slightly better in women compared to men . This low survival rate has been attributed to ∼57% of lung cancers being diagnosed at a later stage (stage IV) . In 2012, for the first time, lung cancer mortality was the first cause of cancer death in women in developed countries . The epidemiology of lung cancer is somewhat unknown in never-smokers, but some risk factors are well defined, including exposure to environmental tobacco smoke (ETS) or working in certain occupations. Exposure to residential radon plays an important role in the genesis of lung cancer, although a complete description of the nature of this role is lacking, despite the publication of recent studies  and its classification as the first risk factor for lung cancer in never-smokers . Different meta-analysis and pooling studies have shown a dose–response relationship between radon exposure and lung cancer risk [6–8]. Recent evidence has suggested that the molecular profile of lung cancer differs by carcinogen exposure history, such that lung cancer in never-smokers arises via a different biological pathway than lung cancer in ever-smokers [9, 10]. Some driver mutations/alterations, including alterations in the EGFR and ALK genes, have been recently discovered to occur primarily in never-smokers. These observations have facilitated the use of targeted treatments that have an impact on survival [11, 12]. Interestingly, these mutations are mostly present in stage IV adenocarcinoma, which is consistent with what is known of the epidemiology of lung cancer in nonsmokers . Radon is a gas that occurs naturally as a decay product of the uranium present in the earth's crust; it tends to accumulate indoors, mainly in dwellings and workplaces. Radon's most stable isotope, 222Rn, has a half-life of 3.8 days and releases high-energy alpha radiation when decaying into elements. Because of this half-life, 222Rn itself engenders little radiation risk. However, two of its decay products, polonium 218 (218Po) and 214 (214Po), have a very short half-life and release alpha radiation when decaying to other products . Alpha radiation releases a large amount of energy in a very short linear track. Alpha particle interaction with cells in general, including lung epithelial cells, is well known to potentially induce large-scale molecular changes, chiefly DNA double-strand breaks, translocations and gene deletions . It is this type of damage that is thought to ultimately enhance the radon-associated risk for lung cancer . Although a role for radon in the genesis of p53 gene mutations in lung cancer has been suggested, it has not been consistently observed . Similarly, the occurrence of KRAS point mutations in radon-exposed miners with lung cancer has also been reported, although this finding has not been confirmed . Additionally, some never-smokers with adenocarcinoma are known to present with signature EGFR mutations and ALK translocations. There is a paucity of epidemiological investigations into the factors that might be responsible for producing these molecular changes. We suggest that residential radon could have a role in the genesis of one or both of these alterations in this subgroup of lung cancer patients. There is only one research study available on the relationship between residential radon and EGFR alterations, and its researchers observed a lack of association. However, this study included only 70 patients and was performed in an area without elevated radon concentrations . In an effort to test our hypothesis, we have studied a region in Spain with high but variable exposure to radon, where the population is stable and has lived for an extended period of time in the same dwellings . Thus, we have sought to find out if there is any association between residential radon exposure and mutations/alterations in the EGFR and ALK genes. This study is a case series consisting of lung cancer patients originally recruited for a multicentre, hospital-based, case–control study involving nine Spanish hospitals. The overall objective of this study, termed LCRINS (Lung Cancer Risk Factors in Never Smokers), is to identify and characterise the different risk factors for lung cancer in never-smokers, with special emphasis on residential radon. Patient recruitment started in 2011 and is ongoing. Lung cancer cases are prospectively included as they are being diagnosed at the participating hospitals. At these hospitals, the pulmonologist responsible for diagnosing lung cancer takes part in the study and identifies lung cancer patients who have never smoked. The estimated sample size calculated at the beginning of the study was 250 cases, but this number was increased due to a longer recruitment period. The study protocol was approved by the Galician Ethics Committee (2010/295) and all participants signed a written consent before taking part in the research. All cases had a pathologically confirmed lung cancer diagnosis. To be included in the study, patients had to be aged ≥30 years with no upper age limit and no previous cancer history. Cases were recruited between January 2011 and April 2015. To be defined as a never-smoker, participants had to fulfil the World Health Organization (WHO) definition for never-smokers. A never-smoker was thus defined as: 1) an individual reporting <100 cigarettes smoked in his/her lifetime; or 2) an individual who had not smoked >1 cigarette per day for >6 months in his/her lifetime. Smoking status was assessed by interviewing each participant and recording their responses to a questionnaire; if the case was an ever-smoker, they were excluded from the study. Histological type was obtained from the pathology records and the same was done for EGFR mutations and ALK translocations. EGFR mutations were first determined systematically in the study hospitals in October 2010, and ALK translocations were first determined in January 2011. All participants answered a standardised questionnaire regarding lifestyle, with special emphasis on the risk factors for lung cancer. The interviews were performed by the clinicians taking part in the study, who were previously trained to avoid interviewer bias. Each participant provided a total of 3 mL of blood that was collected in an EDTA container with the objective of determining the genetic polymorphisms associated with the susceptibility genes for lung cancer. Samples were stored at −80 °C until analysis. The questionnaire focused on ETS, past and present occupation, diet and performing do-it-yourself activities, such as painting, model-making, furniture refinishing and varnishing, which have been reported to increase the risk of lung cancer in never-smokers . Participants used a radon device in their homes for a minimum of 3 months. The radon detector was of the alpha-track type (CR-39; Radosys Ltd, Budapest, Hungary), which is among the most reliable radon devices. The detector was given out at the hospital with written instructions on how to use it, including pictures on how to correctly position it in the home; 3–4 days after being given the detector, participants were contacted by phone to make sure that the device had been properly positioned, by following the instructions provided. Once the exposure period had finished, participants were called and reminded to send the device back in the sealed envelope given at the hospital. Radon detectors were read at the Galician Radon Laboratory (University of Santiago de Compostela, Santiago de Compostela, Spain). Periodical quality assurance included the use of blanks and double detectors in some of the dwellings. The laboratory has taken part in intercomparison exercises organised by the University of Cantabria (Santander, Spain) and the Nuclear Safety Council of Spain (Madrid, Spain) with excellent results [20, 21]. A seasonal adjustment was considered for all measurements. The same procedure was used in all participating centres. Screening for mutations in EGFR exons 18, 19, 20 and 21 was performed with the CE-IVD marked cobas EGFR Mutation Test kit (Roche Diagnostics, Mannheim, Germany) according to the manufacturer's protocol. 4-μm sections of each sample were collected using pretreated slides (Dako Denmark A/S, Glostrup, Denmark) for each test, and dried at 60 °C for 1 h. Detection of ALK rearrangements on 2p23 was performed with the Vysis ALK Break Apart FISH Probe Kit (Abbott Molecular, Abbott Park, IL, USA). We initially performed a descriptive analysis followed by a bivariate analysis comparing the age at diagnosis of EGFR mutation-positive individuals and did the same for ALK translocation-positive individuals. We also compared residential radon concentrations in EGFR-mutated versus nonmutated individuals, and between patients with and without ALK translocations. We also compared radon concentrations within each EGFR mutation type using median concentrations between groups. For specific types of EGFR mutations, we only compared exon 19 deletion versus exon 21 (L858R) single-point substitution mutation because these were the most frequent mutations observed. To perform these comparisons, we used the median test, which is the most appropriate nonparametric test to evaluate if median radon concentration differs for different EGFR mutations or ALK status. We considered p<0.05 as significant. All analyses were performed with IBM SPSS Statistics for Windows, version 22.0 (IBM Corporation, Armonk, NY, USA). No one refused to participate in the study. Only two patients did not place the radon device in their homes. The return rate of the radon devices was also quite high, with only 38 radon detectors (11.7% of the total number) not returned for various reasons. The study recruited 323 never-smokers with lung cancer; 80% were females, with a median age of 70 years (interquartile range: 61–78 years). The predominant histological type was adenocarcinoma (78.3%) followed by squamous cell carcinoma (9.3%); 60.4% of all cases were stage IV at diagnosis. Median radon concentration was 182 Bq·m−3 (interquartile range: 103–333 Bq·m−3); 44% of participants had lived with a smoker for >20 years. Participants lived a median of 30 years in the dwelling where radon was measured (interquartile range: 15–44 years). A detailed description of their characteristics is shown in table 1. Table 2 describes the mutations observed in the EGFR and ALK genes. EGFR mutation analysis was performed in 209 (64.7% of the total number) participants, while ALK analysis was performed in 80 (24.8%) participants. EGFR was mutated in 42% of those analysed, and the most frequent mutation was exon 19 deletion (56.3% of all mutations), followed by exon 21 (L858R) single-point substitution mutation (39.1%). The remaining mutation frequency was extremely low. ALK was rearranged in 15% of those analysed. The median age of patients with an EGFR mutation was 67.5 years compared with 69 years for those without mutations in EGFR (p=0.811). Median age at diagnosis of individuals with translocated ALK was 57 years, compared with 67.5 years for those without ALK translocations (p=0.002). Table 3 shows the radon concentrations by EGFR and ALK alteration status. 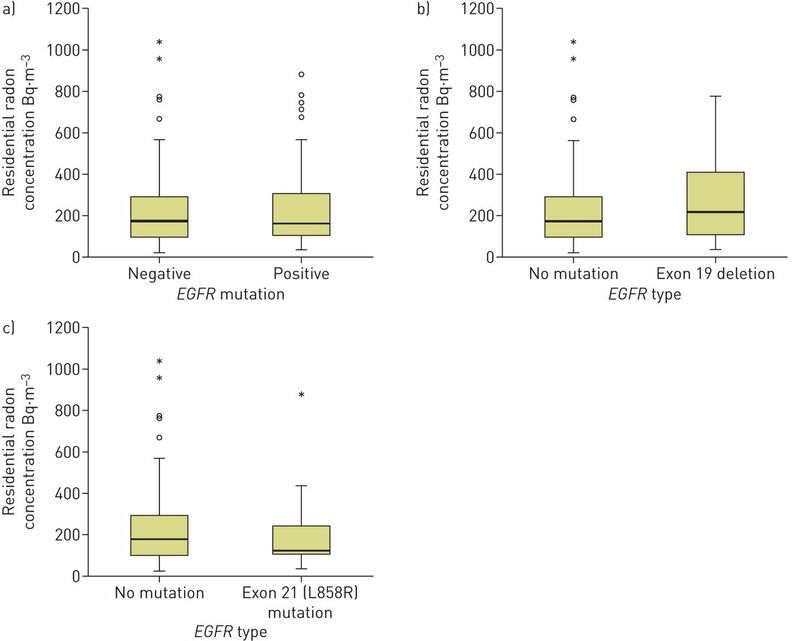 The differences in radon concentrations in those whose tumour had an EGFR mutation compared with wild type were small (160 Bq·m−3 for those with an EGFR mutation compared to 174 Bq·m−3 when EGFR was not mutated) (figure 1a). When radon concentrations were analysed by particular EGFR mutations, there were no statistically significant differences. When we specifically compared the two most frequent mutations, exon 19 deletion versus exon 21 (L858R) single-point substitution mutation, we observed a nearly significant difference (p=0.057). The individuals with exon 19 deletions had a close to two-fold higher radon concentration in their homes (216 Bq·m−3 for exon 19 deletion compared to 118 Bq·m−3 for exon 21 (L858R) single-point substitution mutation). Residential radon concentrations for nonmutated EGFR participants and those with exon 19 deletions or exon 21 (L858R) single-point substitution mutations are shown in figure 1b and 1c, respectively. When a similar analysis was performed for ALK translocations, there were no significant differences in measured radon levels between individuals with ALK translocations versus ALK-negative patients. Nevertheless, participants with ALK translocations had a much higher radon concentration in their homes than those with normal ALK (290 versus 165 Bq·m−3, respectively) (figure 2). Relationship between residential radon exposure and a) EGFR mutations, b) exon 19 deletions and c) exon 21 (L858R) single-point substitution mutations. Asterisks represent outliers, i.e. values outside the 95% percentile. Relationship between residential radon and ALK rearrangements. Asterisks represent outliers, i.e. values outside the 95% percentile. We sought to determine if residential radon might be associated with alterations in driver genes of never-smokers with lung cancer. We did not observe an association between residential radon level and the overall pattern of EGFR mutation. However, since alpha radiation is associated with large-scale genomic alterations, we compared radon levels in never-smokers with regard to known molecular alterations. We found that individuals whose tumours had exon 19 deletions had close to two-fold higher residential radon levels than individuals with exon 21 (L858R) single-point substitution mutations. Residential radon level was also much higher in the home of patients whose tumours harboured an ALK translocation compared with individuals who did not have such a translocation. This observation could mean that alpha radiation (through residential radon) might have a role in lung carcinogenesis in never-smokers. 15% of ALK-tested patients had rearrangements in the present study. This agrees with other studies that report 5–11% of ALK rearrangements in never-smokers . The study of Kwak et al. observed a frequency of 5.5%, although this included only 24% of patients who were ever-smokers. Other studies have reported rearrangement frequencies of 6.9% in the USA, although with a frequency of ever-smokers close to 40% . The positive rate for ALK in the largest cohort study including ever- and never-smokers was 5% . Similar to other reports, we observed that patients with EGFR mutations have a similar age than patients with no mutations . For ALK translocations, translocation-positive patients are usually diagnosed at younger ages, approximately 7–10 years earlier than never-smokers without ALK translocations . In our case, ALK-translocated patients were 10 years younger and the difference was statistically significant. Ren et al. observed a similar result in a cohort of Chinese women. The possible effect of residential radon on mutations/translocations in the driver genes EGFR and ALK is intriguing and provides a plausible new explanation for the different biological characteristics of lung cancer in never-smokers compared to ever-smokers. The only available studies were published by Taga et al. and Mezquita et al. in 2012 and 2015, respectively. Taga et al. observed no association between residential radon and EGFR mutations. Nevertheless, this study included only 70 patients and exposure to radon was low. Only 27% of participants had radon concentrations >83 Bq·m−3 whereas in the present study 75% of participants had radon concentrations >100 Bq·m−3. This high radon exposure provides a plausible explanation for its influence on the alterations of driver genes since high radon exposure is the most evident difference between the study by Taga et al. and the present one. The study by Mezquita et al. included only 31 patients from Madrid (Spain), generally a low radon area. They observed that ALK rearrangements were associated with levels higher than the action levels recommended by WHO. Mutations in the genes that encode tyrosine kinase receptors are frequent in lung adenocarcinoma but infrequent in squamous cell carcinoma . Various studies have observed that the molecular signatures of both lung cancer types are different, with more (mutated) genes playing a role in the lung carcinomas of ever-smokers compared to never-smokers . An explanation may be that tobacco, with thousands of chemical substances and dozens of demonstrated carcinogens, induces a spectrum of DNA lesions, which is dominated by small alterations in signalling molecules. In the case of the lung carcinomas in never-smokers, it may be that ETS plays a role, but a recent paper has shown that there are no statistically significant differences in the mutation patterns of EGFR and ALK of never-smokers exposed to ETS compared to those not exposed to it . The lack of association between exposure to ETS and alterations in driver genes leaves the door open for a possible effect of alpha radiation on these genes. There is evidence for different molecular pathways for lung cancer in never- compared to ever-smokers, even in tumours of the same histological type, such as adenocarcinoma [27, 29]. While it is not possible to completely explain the differences in residential radon level of patients whose tumours had an EGFR exon 19 deletion compared with those whose tumours had an exon 21 (L858R) single-point substitution mutation, alpha radiation likely induces cluster damage, leading to deletion events . The difference in the character of lesions associated with alpha exposure is also consistent with the differences in radon levels we observed for ALK translocations. Although we did not find significant differences in radon levels associated with translocation events, figure 2 suggests that the small number of ALK translocations (only 12) may have affected the statistical power of our findings. Our cohort was also small and ALK rearrangements had a low frequency, making it more difficult to find any association. The fact that most of our participants were females who tend to spend more time at home , and the fact that the Galician population has low mobility (participants in our study have lived a median of 30 years in the dwellings where radon was measured) strengthens the hypothesis that radon induces this profile of mutations. Although some studies have assessed the role of alpha radiation in tumour treatment in animal models , there is a paucity of studies investigating how alpha radiation might cause specific alterations in the EGFR or ALK genes. Recent research suggested that ionising radiation might be involved in the activation of the EGFR extracellular signal and might have a role in DNA repair . Alpha radiation might also be involved in cellular signalling without having a direct impact on lung epithelial cells, just through being present in the cell surroundings. This is known as the radiation-induced bystander effect, and results in genomic instability . The present study has four important strengths. First, it has been performed exclusively in never-smokers; therefore, potential confounders related to active tobacco consumption are not present. Second, the study area has been previously defined as a radon-prone area and our population has lived in the same dwellings for a long time (median residence time: 30 years). Third, the high variability of indoor exposure allowed us to study possible dose–response associations not found in other settings. Furthermore, the multicentre design of the study produced a moderately large sample size. Finally, 89% of participants returned the radon detector. This is a very high return rate if we take into account the high mortality of lung cancer and the fact that most of the participants who entered study had stage IV lung cancer. The present research has some limitations. Only 65 and 25% of all patients were tested for EGFR and ALK, respectively. EGFR testing is usually performed in stage IV adenocarcinoma; the analysed percentage corresponds approximately to the expected figure. The current Spanish guidelines recommend EGFR screening in these individuals . For ALK, we have to discount those cases with small cell lung cancer and histological types other than adenocarcinoma, stages I–III and patients who were already EGFR-positive. Once these patients are eliminated, because they do not fulfil the criteria for ALK testing, the remaining number approximately coincides with the number of patients tested for ALK. Therefore, we think that there is no selection bias regarding the testing performed in our participants. Nevertheless, we recognise that the sample size is small, especially for ALK rearrangement. A further limitation, related to sample size, is that we had too few males to perform a separate analysis in this subgroup. To conclude, the present findings might suggest that residential radon exposure could have a role in causing genetic mutations in driver genes in never-smokers with lung cancer, although the results of the present study are not statistically significant. Despite being the second risk factor for lung cancer after tobacco consumption, radon exposure has been neglected by clinicians when considering risk factors for lung cancer. Further study on the effects of radon on nonsmokers is urgently needed, but it should be remembered that radon increases the risk of all lung cancers and health authorities should protect the entire population from this risk. Authors’ contributions: A. Ruano-Ravina, J.M. Barros-Dios, M. Provencio and A. Fernández-Villar designed the research and had the idea for the study. I. Abdulkader, I. Parente-Lamelas and V. Leiro-Fernández performed the literature search. A. Ruano-Ravina, J. Abal-Arca, C. Martínez, M. Torres-Durán and R. Guzmán-Taveras analysed the data. All authors interpreted the data, provided intellectual input on the paper, approved the final version of the article and are publicly responsible for its content. Cancer survival in Europe 1999–2007 by country and age: results of EUROCARE—5: a population-based study. Lancet Oncol 2014; 15: 23–34. National Cancer Institute. SEER Stat Fact Sheets: Lung and Bronchus Cancer. http://seer.cancer.gov/statfacts/html/lungb.html Date last accessed: June 8, 2015. Date last updated: June 21, 2016. Global cancer statistics, 2012. CA Cancer J Clin 2015; 65: 87–108. Lung cancer in never-smokers: a case-control study in a radon-prone area (Galicia, Spain). Eur Respir J 2014; 44: 994–1001. World Health Organization. WHO handbook on indoor radon: a public health perspective. Geneva, World Health Organization, 2009; p. 94. Meta-analysis of residential exposure to radon gas and lung cancer. Bull World Health Organ 2003; 81: 732–738. Radon in homes and risk of lung cancer: collaborative analysis of individual data from 13 European case-control studies. BMJ 2005; 330: 223. Nonlinear dose-response relationship between radon exposure and the risk of lung cancer: evidence from a meta-analysis of published observational studies. Eur J Cancer Prev 2015; 24: 267–277. Lung cancer in never smokers: molecular profiles and therapeutic implications. Clin Cancer Res 2009; 15: 5646–5661.
. Lung cancer in never smokers: a different disease. Nat Rev Cancer 2007; 7: 778–790. Screening for epidermal growth factor receptor mutations in lung cancer. N Engl J Med 2009; 361: 958–967. Anaplastic lymphoma kinase inhibition in non-small-cell lung cancer. N Engl J Med 2010; 363: 1693–1703.
. Genomic alterations in lung adenocarcinoma. Lancet Oncol 2015; 16: e342–e351. The cellular and molecular carcinogenic effects of radon exposure: a review. Int J Mol Sci 2013; 14: 14024–14063.
. Is there a specific mutation of p53 gene due to radon exposure? A systematic review. Int J Radiat Biol 2009; 85: 614–621. p53 and K-ras in radon-associated lung adenocarcinoma. Cancer Epidemiol Biomark Prev 1995; 4: 791–793. EGFR somatic mutations in lung tumors: radon exposure and passive smoking in former- and never-smoking U.S. women. Cancer Epidemiol Biomarkers Prev 2012; 21: 988–992. Factors underlying residential radon concentration: results from Galicia, Spain. Environ Res 2007; 103: 185–190. Leisure time activities related to carcinogen exposure and lung cancer risk in never smokers. A case-control study. Environ Res 2014; 132: 33–37.
. Influence of environmental changes on integrating radon detectors: results of an intercomparison exercise. Radiat Prot Dosimetry 2007; 123: 529–536. Intercomparison exercise on external gamma dose rate under field conditions at the laboratory of natural radiation (Saelices el Chico, Spain). Radiat Prot Dosimetry 2013; 155: 459–466. Routine molecular profiling of patients with advanced non-small-cell lung cancer: results of a 1-year nationwide programme of the French Cooperative Thoracic Intergroup (IFCT). Lancet 2016; 387: 1415–1426.
. Molecular profile of lung cancer in never smokers. EJC Suppl 2013; 11: 248–253. Crizotinib versus chemotherapy in advanced ALK-positive lung cancer. N Engl J Med 2013; 368: 2385–2394.
. Targeting anaplastic lymphoma kinase in lung cancer. Clin Cancer Res 2011; 17: 2081–2086. EML4-ALK translocation is associated with early onset of disease and other clinicopathological features in Chinese female never-smokers with non-small-cell lung cancer. Oncol Lett 2015; 10: 3385–3392. Is there any role for residential radon in patients with non-small-cell lung cancer (NSCLC) harbouring molecular alterations? Preliminary results. J Thorac Oncol 2015; 10: Suppl 2, S303–S304. No impact of passive smoke on the somatic profile of lung cancers in never-smokers. Eur Respir J 2015; 45: 1415–1425. Mutational and epigenetic evidence for independent pathways for lung adenocarcinomas arising in smokers and never smokers. Cancer Res 2006; 66: 1371–1375.
. Formation of clustered DNA damage after high-LET irradiation: a review. J Radiat Res 2008; 49: 203–210. Modeling lung cancer incidence in rats following exposure to radon progeny. Radiat Prot Dosimetry 2006; 122: 345–348.
. Importance of EGFR/ERCC1 interaction following radiation-induced DNA damage. Clin Cancer Res 2014; 20: 3496–3506. RAD9 deficiency enhances radiation induced bystander DNA damage and transcriptomal response. Radiat Oncol 2014; 9: 206.
de Castro J, et al. Biomarker testing in advanced non-small-cell lung cancer: a National Consensus of the Spanish Society of Pathology and the Spanish Society of Medical Oncology. Clin Transl Oncol 2015; 17: 103–112.